Sparks in the American Idol Experience motorcade at Walt Disney World in 2009. Jordin Brianna Sparks (born December 22, 1989) is an American singer, songwriter, and actress. She rose to fame in 2007 after winning the sixth season of American Idol; at age 17, she became the youngest winner in the series' history. Her self-titled debut studio album, released later that year, was certified platinum by the Recording Industry Association of America (RIAA) and has sold over two million copies worldwide. The album spawned the Billboard Hot 100 top-ten singles "Tattoo" and "No Air"; the latter, a collaboration with Chris Brown, is currently the third highest-selling single by any American Idol contestant, selling over three million digital copies in the United States. The song earned Sparks her first Grammy Award nomination for Best Pop Collaboration with Vocals. Sparks' second studio album, Battlefield (2009), debuted at number 7 on the Billboard 200 chart. Its lead single, "Battlefield", reached number 10 on the Billboard Hot 100, making Sparks the only American Idol contestant to have her first five singles reach the top 20 on the chart. The second single, "S.O.S. (Let the Music Play)", became Sparks' first number one on the Hot Dance Club Play chart. Throughout her career, Sparks has won numerous awards, including an NAACP Image Award, a BET Award, an American Music Award, a People's Choice Award and two Teen Choice Awards. In 2009, Billboard magazine ranked her as the 91st Artist of the 2000s Decade. In 2012, Sparks was ranked at number 92 on VH1's list of the "100 Greatest Women in Music". As of February 2012, she has sold 1.3 million albums and 10.2 million singles in the United States alone, making her one of the most successful American Idol contestants of all time. Following the release of Battlefield, Sparks branched out from recording music, pursuing careers in acting and Broadway, and designing perfumes. She made guest appearances on several television series, beginning with The Suite Life on Deck in 2009, and later in Big Time Rush in 2010. That year, Sparks made her Broadway debut in the musical In The Heights, starring as Nina Rosario. She made her feature film debut in the musical film Sparkle (2012). In October 2010, Sparks released her first perfume, Because of You..., which was followed by her second perfume, Fascinate, in March 2012, with her third perfume, Ambition, in November 2012. After a five-year solo music hiatus, Sparks released her first mixtape, #ByeFelicia (2014). The release of the mixtape marks the first release under Sparks' new recording deal with Louder than Life/Red Associated Labels, a joint deal with Sony Music Entertainment. Sparks' third studio album, Right Here Right Now, was released in August 2015. 4.4 I'm Mad Are You? Campaign. Sparks was born in Phoenix, Arizona, to Jodi (née Weidmann) Sparks and former professional football player Phillippi Sparks. Sparks has a younger brother, Phillippi "PJ" Sparks, Jr., who plays football at Arizona Christian University. Her father is African-American and her mother is Caucasian. She grew up in the suburbs of Ridgewood, New Jersey, while her father played as a defensive back for the New York Giants. After living in New Jersey, Sparks attended Northwest Community Christian School in Phoenix through the eighth grade. Sparks attended Sandra Day O'Connor High School until 2006 when she was homeschooled to better concentrate on her singing. Sparks is an evangelical Christian and attends Calvary Community Church in Phoenix. On her American Idol biography, she thanks her parents and God for her win. She won an award for best young artist of the year in Arizona three years in a row. Before appearing on American Idol, Sparks participated in and won such talent competitions as Coca-Cola's Rising Star, the Gospel Music Association Academy's Overall Spotlight Award, America's Most Talented Kids, Colgate Country Showdown, and the 2006 Drug Free AZ Superstar Search. Prior to Idol, Sparks frequently performed the national anthem at various local sporting events, notably for the Phoenix Suns, Arizona Cardinals, and Arizona Diamondbacks. Sparks also appeared with Alice Cooper in his 2004 Christmas show and toured with Christian contemporary singer Michael W. Smith in 2006. In 2006, Sparks was one of six winners of the Phoenix Torrid search for the "Next Plus Size Model". She was flown to California, where she was featured in numerous Torrid ads and promotional pieces. A full-page ad for Torrid featuring Sparks ran in the December 2006 issue of Seventeen magazine. In the summer of 2006, Sparks auditioned twice for the sixth season of American Idol: once in Los Angeles but failed to make it past the first round; and again in Seattle after winning Arizona Idol, a talent competition conducted by Phoenix Fox station KSAZ-TV. The Seattle audition is the one seen in the January 17, 2007, broadcast of American Idol, in which she earned a "gold ticket" and the right to appear in the Hollywood Round. American Idol judge Randy Jackson made the offhand prediction that "Curly hair will win this year." While on the show, Sparks gained a loyal fan base known as "Sparkplugs". On May 23, 2007, Sparks was crowned the winner of the sixth season of American Idol. She remains the youngest winner in American Idol history. Cowell said, "Jordin was the most improved over the whole season – didn't start the best, but midway through this was the girl who suddenly got momentum." He included that "Young girl, likeable, and the singer won over the entertainer [Lewis]." Four selected songs Sparks had performed on American Idol, including the season's coronation song, "This Is My Now", were made available on her self-titled EP, released on May 22, 2007, the day before the grand finale. The coronation song "This Is My Now" peaked at number fifteen on the Billboard Hot 100, becoming Sparks' first top-fifteen hit on the chart. The following summer, Sparks took part in the American Idols LIVE! Tour 2007 from July 6 to September 23, 2007, along with other contestants in the top ten. After winning American Idol, Sparks signed to 19 Recordings/Jive Records, becoming the first Idol winner to join the label. On August 27, 2007, she released her debut single, "Tattoo", which peaked at number eight on the Billboard Hot 100, becoming Sparks' first top-ten hit on the chart. The song certified platinum in the United States and Australia. To date, "Tattoo" has sold over two million copies in the U.S.
Sparks released her self-titled debut studio album on November 20, 2007, which debuted at number ten on the Billboard 200. To date, it has sold over a million copies in the U.S and was certified platinum by the RIAA. "No Air", a duet with Chris Brown, was released as the second single from the album in February 2008. In the United States, the song peaked at number three on the Billboard Hot 100 becoming Sparks' best-charting single to date. It was also her first song to appear on the Hot R&B/Hip-Hop Songs chart, where it reached number four. To date, the song has sold over three million copies in the U.S, making Sparks the first American Idol contestant to reach the three million mark. It also became Brown's first song to hit three million. "No Air" also charted in Australia and New Zealand, where it reached number one, receiving platinum certifications in both countries. The album's third single, "One Step at a Time", was released in June 2008. It peaked at number seventeen on the Billboard Hot 100, giving Sparks her fourth top twenty hit on the chart. This makes Sparks the only American Idol contestant to have her first four singles reach the top twenty of the Hot 100. It also charted in the top twenty in Australia, Canada, and the United Kingdom. In New Zealand, the song reached number two and was certified gold by the RIANZ. In August 2008, Sparks co-headlined the Jesse & Jordin LIVE Tour with Jesse McCartney in the United States. "S.O.S. (Let the Music Play)", was released as the second single from Battlefield on September 15, 2009. The song topped the U.S Hot Dance Club Songs chart, becoming Sparks' first number one on the chart and peaked in the top fifteen in the United Kingdom. During this time, she recorded the duet, "Art of Love", with Australian artist Guy Sebastian for his fifth studio album, Like It Like That. The song reached the top ten in Australia and New Zealand and was certified platinum by the Australian Recording Industry Association. The third single from Battlefield, "Don't Let It Go to Your Head", was released in the United Kingdom on January 8, 2010. The song reached a peak of number sixteen on the UK Singles Chart despite no physical release. On May 5, 2011, it was revealed that Sparks' would release a non-album single titled "I Am Woman". To support her new single, Sparks served as an opening act for the NKOTBSB summer tour. On May 12, 2011, Sparks performed "I Am Woman" on the American Idol Top 4 results show. It debuted on the US Billboard Hot 100 at number eighty-two with 33,000 downloads sold. It also debuted on the US Billboard Digital Songs at number fifty-seven. Sparks performed "I Am Woman" on Regis and Kelly on June 14. Sparks stated in an August 2011 interview there was no scheduled release date for her third album which was still in production. A song titled "You Gotta Want It" was to be part of an NFL compilation album titled Official Gameday Music of the NFL Vol. 2. According to reports, the song would be available to download on iTunes and Amazon on September 27. The song was co-written by Chris Weaver and Matthew J. Rogers while being produced by Cash Money Records’ Cool & Dre. On October 7, 2011, RCA Music Group announced it was disbanding Jive Records along with Arista Records and J Records. With the shutdown, Sparks (and all other artists previously signed to these three labels) would release her future material (including her upcoming third studio album) on the RCA Records brand. On November 14, 2011, it was announced that Sparks had recorded an original song called "Angels Are Singing" as a part of ABC Family's "12 Dates of Christmas". On February 29, 2012, Sparks' boyfriend Jason Derulo took to Twitter announcing the official remix of his single "It Girl" featuring Sparks. There was a video released with the remix, which showed home videos, of Derulo and Sparks together as well as pictures. On July 22, 2013, it was announced that the first promotional track from her upcoming third studio album would be released on August 1, 2013. "Skipping a Beat" was officially released on August 1, 2013. The buzz single became available for download on August 13, 2013. Sparks was featured on Jason Derulo's third studio album, Tattoos, which was released on September 24, 2013. Sparks and Derulos' duet was titled "Vertigo". It was announced that Sparks' third album had officially been completed and was awaiting release. However, it was later announced that new music from Sparks would not be released until early 2014 due to timing issues with acting projects  as well as placement issues within her label RCA. On August 9, 2013, it was announced that Sparks had signed on to join the cast of the action science fiction-thriller film Left Behind. Sparks' character is named Shasta, but for the most part, her role is being kept under wraps. One of the films, producers Paul Lalonde said that "She will be a passenger on a plane that the film’s main character Captain Rayford Steele is piloting. Sparks' will co-star alongside Nicolas Cage as Captain Rayford Steele, Chad Michael Murray as Cameron "Buck" Williams and Nicky Whelan as Hattie Durham. The film is set for release on October 3, 2014. The film's shooting began on August 9, 2013, in Baton Rouge, Louisiana. On October 7, 2013, it was announced that Sparks would guest star in an upcoming episode in the fourteenth season of CSI: Crime Scene Investigation. Sparks played Alison Stone, a high school teacher who somehow found herself scared and covered in blood in a hotel room crime scene. The season episode, titled "Check In & Check Out" was set to air on November 20, 2013. After experiencing multiple delays in the release of Sparks' third album due to RCA refusing to put her in their roster, citing that her acting projects had prevented them from reaching a deal, Sparks was released from her contract from RCA records and eventually signed to Salaam Remi's new label imprint 'Louder than Life', a subsidiary of Sony Music. Remi had previously worked with Sparks on the Sparkle film soundtrack. As a result of the new deal, all the material Sparks had previously recorded for her third album under RCA has subsequently been scrapped and had since begun re-recording and writing new material for her third album since January 2014. An official announcement of Sparks' signing to the new label had only been released a year later in August 2014. On August 15, 2014, Salaam Remi took to Instagram to preview the logo for his new label, Louder than Life, a subsidiary of Sony Music. Remi also announced that Sparks is now a part of the Louder than Life roster. In an article with Music Connection, Remi also announced he would be producing Sparks' upcoming album. During a promotional tour for Sparks' new movie, Left Behind, Sparks announced that she was in the finishing stages of her new album. Sparks announced that she is also no longer with her previous label, RCA Records. Sparks stated her single was due by the end of the year, with an album release in 2015. Sparks stated that she and her label were picking the first single, first look, and deciding on the album name. On December 2, the song "It Ain't You" from Sparks's mixtape #ByeFelicia, became available for pre-order on major music markets and was also uploaded to Sparks's Vevo YouTube page. The single was released on December 15, 2014, as a promotional single and first off from Sparks' third album. On December 16, Right Here Right Now became available for pre-order on Sparks' official website. On February 11, the first single for Sparks' album Double Tap featuring 2Chainz became available for pre-order. The single was released on March 2, 2015, and the music video was released on March 10, 2015. In April 2008, Sparks was diagnosed with an acute vocal cord hemorrhage, an injury that results from an overuse of vocal cords. Sparks was put on vocal rest and canceled several appearances, including scheduled cameos on Alicia Keys's tour. Sparks later recovered and rejoined the tour in May 2008. In 2011, Sparks attended the Muhammad Ali Celebrity Fight Night showcasing a noticeably slimmer figure. At the time Sparks admitted she had lost 30 pounds. Sparks eventually lost roughly 50 pounds, weighing in at 155 to 161 pounds which she revealed on the Today Show in 2014. Sparks revealed she had fallen ill in December 2010 with walking pneumonia, after her stint on Broadway. This was the motivation for Sparks to begin to change her lifestyle which resulted in a weight loss. In October 2010, Sparks released her debut fragrance, "Because of You...." This fragrance was exclusively distributed at first by Dots Department Stores, but by November was made available to other retail stores. Sparks wanted this product to be affordable for her fans, yet still high end. "When I was starting this project, I really wanted it to be affordable. I looked at some other celebrity fragrances, and they were like $80. Even now, I look at a fragrance that's $80, and I can't bring myself to spend that much." In March 2012, due to the success of her first fragrance, Sparks' released her second fragrance, Fascinate, exclusively with Dots Fashions as a sister scent to her first. It was announced on October 22, 2012, that Sparks was releasing her third fragrance Ambition. In an interview Sparks said; "Right now, I feel like I can take on the world. Ambition is the perfect word for where I am in my life right now". Her new scent is available in retail stores such as Bon-Ton. It was released in stores and online on November 8, 2012, before Sparks presented the fragrance at an official launch party in Milwaukee on December 1, 2012. In 2012, Sparks made her film debut in Sparkle. Following the release of Sparkle in 2012, Sparks began auditioning for several television and film roles while also receiving scripts from companies interested in having her apart of their projects. First of which was an indie drama film titled The Inevitable Defeat of Mister & Pete which follows two inner-city youths left to fend for themselves over the summer after their mothers are taken away by the authorities. Sparks plays Alice a neighbor and friend of character Mister. She will also be in the film, The Grace of Jake, which follows ex-inmate and wandering musician Jake who travels to a small town in Arkansas intent on exacting revenge from his father, but begins to unravel a complicated family history as he befriends the locals. The film is currently in post production and is set for release on October 3, 2014. Sparks plays Nicole Lovely the preachers daughter. Sparks played the part of Abby in Dear Secret Santa, a Lifetime Television romantic Christmas film that premiered on November 30, 2013. Sparks will play Shasta Carvell in Left Behind, an apocalyptic thriller, based on the novel series of the same name, and is a reboot of Left Behind: The Movie, which is based on the idea of a pre-tribulation Rapture. The film is currently in post production and is set for release in early 2014. In November 2013 Sparks guest starred on CSI: Crime Scene Investigation. Sparks plays Alison Stone, a high school teacher who somehow finds herself scared and covered in blood in a hotel room crime scene. The season episode, titled "Check In & Check Out" aired on November 20, 2013. Sparks' interest in non-profit causes began prior to her appearance on American Idol. She performed at the Arizona Right to Life conference in 2005. I'm Mad Are You? Campaign. On February 3, 2010, Sparks and David Archuleta performed at the "Jordin Sparks Experience", held at the Eden Roc Renaissance Hotel in Miami Beach, Florida. All proceeds raised by the event went to a number of charities, including the Miami Children’s Hospital Foundation. The following day both Sparks and Archuleta delivered teddy bears to children at the hospital. Since 2008, Sparks and her campaign, "I'm Mad Are You" travels to the Super Bowls designated city to host a week of charitable events, to raise money for several charities. In June 2010, the "Thumbs Up to X the TXT" pledge campaign, established by "The Allstate Corporation", made its way to Sparks' Battlefield Tour, presented by Mike & Ike to encourage teens and their families not to text while driving. Fans at Sparks' concerts made a pledge not to text and drive by adding their thumbprint to a traveling banner at each of her shows. The campaign began at Sparks' Battlefield Tour on June 3, 2010, and ended on July 18, 2010. Sparks is the main spokesperson for the "I’m M.A.D., Are You?" campaign. She also supports Alex’s Lemonade Stand Foundation, which helps to raise money for children with cancer. Sparks traveled to Louisiana in June 2010 to visit the Gulf Coast oil spill with the Audubon Society to view the effects of the oil spill on the wildlife and marshes. Sparks is also a member of the National Youth Leadership Committee for the Ronald Reagan Centennial Celebration, along with Nick Jonas, Genevieve Ryan, and Brodi Conover. ^ "Jordin Sparks". Glendaleaz.com. 2007-05-11. Retrieved 2015-08-24. ^ "Jordin Sparks". Allmusic. Rovi Corporation. Retrieved 2011-01-10. ^ Parker, Lyndsey (2010-11-24). "Does Winning 'American Idol' Even Matter Anymore?". Yahoo! Music. Yahoo! Inc. Archived from the original on 2012-02-16. ^ a b Grein, Paul (2009-10-07). "Week Ending Oct. 11, 2009: Oprah Saves The Music Industry". Yahoo! Music. Yahoo! Inc. Retrieved 2011-01-08. ^ "Chart Beat Tuesday: Neil Diamond, Kelly Clarkson, Jordin Sparks – Chart Beat". Billboard. Prometheus Global Media. Retrieved 2011-01-10. ^ "Billboard Charts – Decade-end Artists – Artists Of The Decade". Billboard. Prometheus Global Media. Retrieved 2010-08-19. ^ "VH1's 100 Greatest Women In Music (Complete List)". VH1. MTV Networks. 2012-02-13. Archived from the original on 2012-03-04. Retrieved 2012-06-07. ^ Masley, Ed (2012-07-29). "Best-selling American Idols: Kelly Clarkson to Scotty McCreery". Azcentral.com. Retrieved 2014-08-09. ^ "Jordin Sparks To Drop Bye Felicia Mixtape On Tuesday—Hear A Teaser!". Popdust. ^ "Life in Pictures: Jordin Sparks". LA Times. Archived from the original on September 18, 2014. Retrieved September 18, 2014. ^ Johnson, L.A. (2007-05-22). "'Idol' worship wanes - Pittsburgh Post-Gazette". Post-gazette.com. Retrieved 2013-01-02. ^ Rennie Dyball (May 28, 2007). Hometown Idols. People. Retrieved 2010-02-25. ^ "WORLD Magazine Today's News, Christian Views". Worldmag.com. Retrieved 2009-08-30. ^ "Torrid Model Search winner". Archived from the original on 2007-03-04. Retrieved 2008-10-01. ^ Addict, Idol (2007-05-28). "Jordin Sparks interview". Americanidol1thatuwant.blogspot.com. Retrieved 2011-10-18. ^ Buckman, Adam (2007-01-19). "NYPost.com". New York Post. Retrieved 2009-08-30. ^ Martindale, Stone (2006-05-25). "Jordin Sparks? Simon says Melinda should have won". M&C. Retrieved 2008-08-28. ^ "Jordin Sparks – Jordin Sparks (EP)". Music Square. Retrieved 2011-01-08. ^ a b c d e f g h i "Jordin Sparks - Song Chart History". Macrovision. Retrieved 2011-01-08. ^ "'American Idol': Lazaro Arbos sent home, making 'Idol' history". Fox News. April 12, 2013. Retrieved April 12, 2013. ^ "Jordin Sparks signs with Jive Records group". Today. MSNBC. 2007-08-17. Retrieved 2011-01-08. ^ "Tattoo – Single – United States". iTunes Store. Apple Inc. Retrieved 2011-01-08. ^ a b "RIAA – Gold & Platinum – December 19, 2008". Recording Industry Association of America. Retrieved 2011-01-05. ^ a b "ARIA Charts – Accreditations – 2008 Singles". Australian Recording Industry Association. Archived from the original on 2008-09-27. Retrieved 2009-07-16. ^ Green, Paul (2009-10-07). "Week Ending Oct. 4, 2009: A Debut Like Buttah". Yahoo! Music. Yahoo! Inc. Retrieved 2011-01-08. ^ "Jordin Sparks – Album – United States". iTunes Store. Apple Inc. Retrieved 2011-01-08. ^ a b "Your Random Weekend Memo – Idol Chatter: American Idol News, Rumours & Information". USA Today. 2010-07-16. Retrieved 2011-01-05. ^ a b c d "Discography Jordin Sparks". australian-charts.com. Hung Medien. Archived from the original on 2010-10-29. Retrieved 2011-01-08. ^ a b c d "Discography Jordin Sparks". charts.org.nz. Hung Medien. Archived from the original on 2012-10-24. Retrieved 2011-01-08. ^ a b "Latest Gold / Platinum Singles". RadioScope New Zealand. Archived from the original on July 24, 2011. Retrieved 2011-01-05. 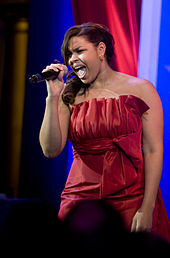 ^ "'Idol' Jordin Sparks to sing anthem at Super Bowl XLII". Azcentral.com. 2007-12-14. Retrieved 2009-08-30. ^ "Alicia Keys, Jordin Sparks Team For Tour". Billboard. Retrieved 2011-01-08. ^ Li, David K. (2008-04-21). "Will 'Idol' Jordin Sparks Ever Sing Again?". New York Post. Retrieved 2009-08-30. ^ "Alicia Keys Announces Australian Tour, Supported by Jordan Sparks!". Mcm Entertainment. 2008-08-11. Retrieved 2011-01-08. ^ "Alicia Keys announces NZ tour". Stuff.co.nz. Fairfax New Zealand. 2008-08-09. Retrieved 2011-01-08. ^ a b "Chart Stats – Jordin Sparks". Chart Stats. Retrieved 2011-01-08. ^ Lamb, Bill. "Jesse McCartney and Jordin Sparks 2008 Concert Tour". About.com. Retrieved 2011-01-08. ^ Lamb, Bill. "2008 MTV Video Music Award Nominations". About.com. Retrieved 2011-01-08. ^ Jemima Lewis (2008-09-14). "Jonas Brothers vs Russell Brand". The Daily Telegraph. London. Retrieved 2008-11-25. ^ Halperin, Shirley (2008-09-09). "Jordin Sparks doesn't regret promise ring remarks at VMAs". Entertainment Weekly. Retrieved 2008-09-23. ^ Castina (2008-10-15). "2008 American Music Awards Nominees". PopCrunch. Retrieved 2008-09-23. ^ "Inaugural Ball Will Be Broadcast Live To Troops". CBS News. CBS Interactive Inc. 2009-01-16. Archived from the original on January 24, 2009. Retrieved 2011-01-08. ^ "Battlefield: Jordin Sparks: Music". Amazon.com. Retrieved 2011-01-08. ^ Vena, Jocelyn (2009-03-11). "Jonas Brothers Announce World Tour With Jordin Sparks". MTV News. MTV Networks. Retrieved 2011-01-08. ^ a b Vena, Jocelyn (2009-08-17). "Jordin Sparks Joins Britney Spears' Circus Tour". MTV News. MTV Networks. Retrieved 2011-01-08. ^ "S.O.S. (Let the Music Play): Jordin Sparks: Music". Amazon.com. Retrieved 2011-01-08. ^ "ARIA Charts – Accreditations – 2010 Singles". Australian Recording Industry Association. Archived from the original on 2012-01-25. Retrieved 2011-01-05. ^ "Don't Let It Go To Your Head (Main Version): Jordin Sparks". Amazon.co.uk. Retrieved 2011-01-08. ^ "Jordin Sparks Sets 'Battlefield' Summer 2010 Tour Dates". Singersroom magazine. 2010-05-11. Retrieved 2011-01-08. ^ "Beauty and the Beast – Alan Menken". iTunes Store. Apple Inc. Retrieved 2011-01-08. ^ "Jordin Sparks Does 'Beauty & The Beast'". Hollywire. 2010-10-18. Retrieved 2011-01-08. ^ "Jordin Sparks Declares "I Am Woman" On New Track | Music News, Reviews, and Gossip on". Idolator.com. 2011-05-05. Retrieved 2011-10-18. ^ Martin, Lara (2011-05-06). "Jordin Sparks, Steven Tyler video for 'Idol'". Digital Spy. Retrieved 2011-05-07. ^ Trust, Gary (2011-05-18). "Adele Stays Atop Hot 100, Lady Gaga Makes 'Glory'-ous Start". Billboard. Prometheus Global Media. Retrieved 2011-05-19. ^ "'Idol' track sales: Jennifer Lopez, Steven Tyler, Jordin Sparks". USA Today. Gannett Company. 2011-05-18. Retrieved 2011-05-19. ^ "Jordin Sparks - Chart history". Billboard. Retrieved 2015-08-24. ^ "Jordin Will Be on Regis + Kelly Next Tuesday | Jordin Sparks Official Site – Jive Records". Jordinsparks.com. Archived from the original on 2011-10-06. Retrieved 2011-10-18. ^ Herndon, Jessica (2011-06-15). "Jordin Sparks Shows Off Her Hot New Bikini Body – Bodywatch, Jordin Sparks". People. Retrieved 2011-10-18. ^ "Jordin Sparks' New Body Secrets Revealed! | Access Hollywood – Celebrity News, Photos & Videos". Access Hollywood. 2011-06-15. Retrieved 2011-10-18. ^  Archived October 22, 2013, at the Wayback Machine. ^ Larry London (2011-08-08). "Former 'Idol' Jordin Sparks Gets Personal on New Album | Arts and Entertainment | English". Voanews.com. Retrieved 2011-10-18. ^ "RCA's New Executive Team Named Under CEO Peter Edge Amid Layoffs (Update)". Billboard.biz. 2011-08-23. Retrieved 2011-10-18. ^ "Radio Industry News, Music Industry Updates, Arbitron Ratings, Music News and more!". FMQB. Retrieved 2011-10-18. ^ "Amy Smart and Mark-Paul Gosselaar Star in the ABC Family Original Movie, "12 Dates of Christmas," Sunday, December 11". TheFutonCritic.com. 2011-11-14. Retrieved 2013-01-02. ^ 03/01/2012. "Jason Durulo feat. Jordin Sparks - "It Girl" - Music Video | American Idol, Jordin Sparks". mjsbigblog. Retrieved 2013-01-02. ^ "Video: Jason Derulo (Feat. His Girlfriend "Jordin Sparks") - It Girl Remix". Worldstarhiphop.com. 2012-03-01. Retrieved 2013-01-02. ^ Kit, Borys (2011-09-12). "'American Idol's' Jordin Sparks to Star Opposite Whitney Houston in 'Sparkle'". Hollywood Reporter. Retrieved 2011-10-18. ^ Sneider, Jeff (2011-09-12). "Whitney Houston, Jordin Sparks 'Sparkle' for Sony – Entertainment News, Film News, Media". Variety. Retrieved 2011-10-18. ^ "Whitney Houston in Talks to Star Alongside Jordin Sparks in 'Sparkle' Remake". Billboard. Retrieved 2015-08-24. ^ Hibberd, James (2011-09-12). "Whitney Houston circling 'Sparkle' musical remake with Jordin Sparks". Inside Movies – EW.com. Entertainment Weekly Inc. Retrieved 2012-01-02. ^ Kit, Borys (2011-09-12). "Whitney Houston in Talks to Star in Music-Themed Drama 'Sparkle' (Exclusive)". The Hollywood Reporter. ^ Sneider, Jeff (2011-09-23). "Cee-Lo Green joins 'Sparkle' cast – Entertainment News, Top News, Media". Variety. Retrieved 2011-11-18. ^ Ballhorn, Kelly (2012-05-21). "WORLD PREMIERE: Whitney Houston & Jordin Sparks Duet 'Celebrate' From 'Sparkle' [AUDIO]". ryanseacrest.com. Archived from the original on 2012-05-21. Retrieved 2012-05-21. ^ "Twitter / iamtikasumpter: Havin a fun day/nite on#celebrate". Twitter.com. Retrieved 2013-01-02. ^ "Twitter / deavanebersole: Guys!!! Don't forget! TONIGHT". Twitter.com. Retrieved 2013-01-02. ^ "Twitter / actorderekluke: Had an awesome day of shooting". Twitter.com. Retrieved 2013-01-02. ^ "Jordin Sparks Among The Cast Of The Inevitable Defeat Of Mister And Pete | Jordin Sparks Official Site - RCA Records". Jordinsparks.com. Retrieved 2013-01-02. ^ Fleming, Mike. "'The Inevitable Defeat Of Mister And Pete' Underway With Jennifer Hudson, Jordin Sparks, Jeffrey Wright And Anthony Mackie". Deadline.com. Retrieved 2013-01-02. ^ "Jennifer Hudson Joins The Inevitable Defeat of Mister and Pete". FilmoFilia. 2012-07-24. Retrieved 2013-01-02. ^ "Soundtracks". Billboard. 2012-12-29. Retrieved 2013-01-02. ^ "Jordin Sparks And Jason Derulo Say Recording Duet Was Like 'World War III'". Entertainmentwise. 2012-11-29. Retrieved 2013-01-02. ^ Naughton, Julie (2010-10-06). "Jordin on Jordin: Sparks Discusses Tattoos, Fragrance and More". WWD Eye Scoop. Women's Wear Daily. Retrieved 2011-01-08. ^ "Jordin Sparks Records New Song With John Legend". Rockstar Weekly. The RockStar Group. Retrieved 2011-01-08. ^ "Ultimate Music | Jordin Sparks "Skipping a Beat" (Song Premiere)". Josepvinaixa.com. 2013-08-01. Retrieved 2014-08-09. ^ "Twitter / JordinSparks: #10daysbeforeitbreaks". Twitter.com. 2013-07-22. Retrieved 2014-08-09. ^ "UB Interviews: The Cast of "The Inevitable Defeat of Mister and Pete" – Jennifer Hudson, Jordin Sparks, Skylan Brooks & Ethan Dizon | UrbanBridgez.com | Urban E-Zine". UrbanBridgez.com. 2013-10-10. Retrieved 2014-08-09. ^ a b "HuffPost Live". Huffington Post. ^ a b "Left Behind - Timeline Photos". Facebook. Retrieved 2014-08-09. ^ "Filming in Louisiana: Nicolas Cage's 'Left Behind' prepping in B.R., plus full local production listings". nola.com. 24 July 2013. Retrieved 6 August 2013. ^ "Nicolas Cage to shoot movie in BR". theadvocate.com. 2 August 2013. Archived from the original on 11 August 2013. Retrieved 6 August 2013. ^ "Twitter / leftbehindmovie: Filming has begun!". Twitter.com. 2013-08-09. Retrieved 2014-08-09. ^ a b c "EXCLUSIVE! Jordin Sparks Gets Bloodied & Frightened On CSI!! Get Crime-Filled Deets HERE!". PerezHilton.com. 2013-10-07. Retrieved 2014-08-09. ^ a b "CSI: Crime Scene Investigation - Zap2it | TV Listing". Tvlistings.zap2it.com. 2000-10-06. Retrieved 2014-08-09. ^ Mike Wass. "Jordin Sparks Gets Into The Christmas Spirit With "This Is My Wish": Watch | Music News, Reviews, and Gossip on". Idolator.com. Retrieved 2014-08-09. ^  Archived December 11, 2013, at the Wayback Machine. ^ "Jordin Sparks sings 'This is My Wish' - Toyota Concert Series". TODAY.com. 2013-12-09. Retrieved 2014-08-09. ^ "Jordin Sparks Talks Album Delay, Label Woes & New Material: Watch". Idolator. Retrieved 2015-08-24. ^ "Jordin Sparks Blames Her Record Label for No New Album Releases (Video)". Jobs.aol.com. Retrieved 2015-08-24. ^ "Exclusive: Salaam Remi Launches Louder Than Life Imprint Through Sony". Billboard. 2013-07-12. Retrieved 2015-08-24. ^ a b c "Producer Crosstalk: Salaam Remi". Musicconnection.com. 2014-05-05. Retrieved 2014-08-20. ^ "Awkward: Wendy Williams Asks Jordin Sparks About Her 'Purity Ring' - EEW Magazine - News from a faith-based perspective". Buzz.eewmagazine.com. 2014-10-02. Retrieved 2015-08-24. ^ "Jordin Sparks Talks Split With Jason Derulo On 'Wendy Williams': Watch". Idolator. Retrieved 2015-08-24. ^ "Yahoo to Stream Billboard Music Awards Red Carpet Show". Billboard. 2014-05-06. Retrieved 2014-08-09. ^ "Instagram". Instagram. Retrieved 2014-08-20. ^ "Jordin Sparks Confirms New Album Set To Release In 2014 After Jason Derulo Split". Hollywood Life. ^ "Jordin Sparks Talks Split With Jason Derulo On 'Wendy Williams': Watch". Idolator.com. ^ "Music: Jordin Sparks - I Wish We'd All Been Ready". Singersroom. ^ "Soooo last night went amazingly well!". inagist.com. Archived from the original on 2014-11-07. ^ "Ultimate Music | Jordin Sparks "Right Here Right Now" (Video Premiere)". Josepvinaixa.com. 2015-07-10. Retrieved 2015-08-24. ^ eMinor. "Dirty Pop with Lance Bass Songs". ReverbNation. ^ "Rap-Up.com -- New Music: Jordin Sparks – 'How Bout Now (Remix)'". Rap-Up.com. ^ "Jordin Sparks To Release '#ByeFelicia' Mixtape: Morning Mix". Idolator.com. ^ "Mix Room: Jordin Sparks Drops #ByeFelicia Mixtape". Singersroom. ^ "Could 'Idol' Star Lose Her Winning Voice? - ABC News". Abcnews.go.com. 2008-04-22. Retrieved 2015-08-24. ^ "Jordin Sparks | Jordin Sparks Reveals Dramatic Weight Loss". Contactmusic.com. Retrieved 2015-08-24. ^ a b "Jordin Sparks' Dramatic Weight Loss! How She Dropped 30 Pounds!". Hollywood Life. 2011-03-22. Retrieved 2015-08-24. ^ Waugh, Heather (2014-05-03). "Jordin Sparks discusses fluctuating weight after shedding 50 lbs in 18 months | Daily Mail Online". Dailymail.co.uk. Retrieved 2015-08-24. ^ Vensel, Ashlee. "Jordin Sparks Collection for Wet Seal". Celebrityclothingline.com. Retrieved 2015-08-24. ^ Jordin Sparks Launches First Fragrance USA Today. Retrieved 2010-10-09. ^  Archived October 26, 2012, at the Wayback Machine. ^ "Jordin Sparks Fragrance Marketing Video". YouTube. 2012-02-23. Retrieved 2013-01-02. ^ "News | Jordin Sparks Reveals New Fragrance, Ambition". Singersroom. 2012-10-21. Retrieved 2013-01-02. ^ "Jordin Sparks Guest Stars on 'The Suite Life on Deck'". Celebrity-mania.com. 2009-09-28. Retrieved 2011-01-10. ^ In the Heights – Broadway. "In the Heights Lands American Idol Champ Jordin Sparks for Summer Run". Broadway.com. Retrieved 2011-01-10. ^ "Team Umizoomi + Jordin Sparks = Legend of the Blue Mermaid". Jordinsparks.com. Retrieved 2011-10-18. ^ "Jordin Sparks Gets Locked Down In Episode of "CSI" [VIDEO". The Urban Daily. 2013-11-06. Retrieved 2014-08-09. ^ "Jennifer Hudson, Jordin Sparks in Inevitable Defeat of Mister and Pete - American Idol News - Reality TV". Digital Spy. 2012-07-23. Retrieved 2014-08-09. ^ "Help us make THE GRACE OF JAKE by Chris Hicky — Kickstarter". Kickstarter.com. 2013-06-11. Retrieved 2014-08-09. ^ "The Grace of Jake (2014)". IMDb.com. Retrieved 2014-08-09. ^ "Jordin Sparks & More Set for Lifetime's Holiday Programming Slate - BWWTVWorld". Broadwayworld.com. 2014-08-03. Retrieved 2014-08-09. ^ "Dear Secret Santa (2013)". IMDb.com. Retrieved 2014-08-09. ^ "Dear Secret Santa". myLifetime.com. Archived from the original on 2014-08-02. Retrieved 2014-08-09. ^ "Filming in Louisiana: Nicolas Cage's 'Left Behind' prepping in B.R., plus full local production listings". NOLA.com. 2013-07-24. Retrieved 2014-08-09. ^ "Nicolas Cage to shoot movie in BR | Home | The Advocate — Baton Rouge, Louisiana". Theadvocate.com. Archived from the original on 2014-10-06. Retrieved 2014-08-09. ^ "Cloud Ten Pictures to Remake Left Behind". Christiancinema.com. Retrieved 2014-08-09. ^ "Left Behind - Are you ready?". Leftbehindmovie.com. 2014-06-20. Retrieved 2014-08-09. ^ "American Idol Winner Jordin Sparks a Pro-Life Advocate, Opposes Abortion". LifeNews.com. 2007-05-25. Retrieved 2015-08-24. ^ a b "Jordin Sparks: Charity Work & Causes". Look to the Stars. Retrieved 2015-08-24. 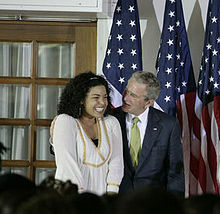 ^ Jordin Sparks Visits Ghana. Retrieved 2010-07-15. ^ "Jordin Sparks PSA". Youtube. ^ "Jordin Sparks and a Host of Teen Celebrities Gather for the Do Something 101 School Supply Volunteer Event". Business Wire. ^ "Jordin Sparks Joins The 'Got Milk' Campaign | Celeb Gossip, Celeb News and Celeb Pictures by I'm Not Obsessed". Imnotobsessed.com. Retrieved 2015-08-24. ^ "Jordin Sparks Dishes On the Jonas Brothers". Shine On Media. 2009-05-20. Retrieved 2015-08-24. ^ "VH1 Divas | Watch VH1 Divas Live September 17th at 9/8c". Vh1. Retrieved 2009-08-30. ^ Vena, Jocelyn (2010-02-02). "'We Are the World' Remake Leaves Jordin Sparks, Tyrese, Celine Dion Starstruck – Music, Celebrity, Artist News". MTV. Retrieved 2011-01-10. ^  Archived February 14, 2010, at the Wayback Machine. ^ "Jordin Sparks to Hold Surprise Performance with Energizer to Benefit the VH1 Save the Music Foundation". VH1 Save The Music. 2011-07-28. Retrieved 2011-10-18. ^ "Energizer's VH1 Save The Music Sweepstakes op Facebook | Facebook". Apps.facebook.com. Retrieved 2011-10-18. ^ "Retrieved January 13, 2014". Little Kids Rock. ^ "Jordin Sparks And David Archuleta Say No To Texting And Driving". Look to the Stars. Retrieved 2015-08-24. ^ https://finance.yahoo.com/news/Allstate-and-American-Idol-prnews-2286586181.html?x=0&.v=1. Retrieved July 15, 2010. Missing or empty |title= (help)[dead link]. Retrieved 2010-07-15. ^ "I'm M.A.D. Are You? - The M.A.D. Girls, Inc". The M.A.D. Girls, Inc.
^ Finley, Adam (2007-07-03). "Teen Choice nominees announced". TV Squad. AOL Inc. Retrieved 2011-01-08. ^ "The 40th NAACP Image Awards". NAACP Image Awards. Archived from the original on February 12, 2009. Retrieved 2011-01-08. ^ "Heartbreak Hotel | Pre-Awards Awards | BET Awards 2008 | BET.com – Live June 24 @ 8:00 pm". BET.com. 2009-09-17. Archived from the original on April 16, 2010. Retrieved 2011-01-10. ^ "Viewers' Choice Nominees | Nominees". BET Awards. BET Networks. Archived from the original on April 29, 2009. Retrieved 2011-01-08. ^ "Beautiful Face Award – My Black is Beautiful". BET Awards. BET Networks. Archived from the original on June 12, 2009. Retrieved 2011-01-14. ^ a b c "2008 Teen Choice Awards winners and nominees". Los Angeles Times. 2007-06-17. Retrieved 2011-01-14. ^ Fleeman, Mike (2008-11-23). "Chris Brown Dominates American Music Awards". People magazine. Time Inc. Retrieved 2011-01-08. ^ "The 2009 Grammy Nominees". Idolator. BUZZMEDIA. 2008-12-03. Retrieved 2011-01-08. ^ a b "People's Choice Awards 2009". People's Choice. Sycamore Productions Inc. Retrieved 2011-01-14. ^ "People's Choice Awards 2009". BMI. Sycamore Productions Inc. Retrieved 2009-05-20. ^ "The 40th NAACP Image Awards". NAACP Image Awards. Archived from the original on March 21, 2009. Retrieved 2011-01-08. ^ "List of nominees for the 2009 MTV Awards". The Age. Australia: Fairfax Digital. 2009-02-20. Retrieved 2011-01-08. ^ "2010 ARIA Nominations". Take40 Australia. mcm entertainment. Archived from the original on 2010-10-02. Retrieved 2010-09-28. ^ "Best Gospel/Inspirational Performance | Soul Train Awards | Shows". BET. 2012-10-30. Retrieved 2013-01-02. ^ Andreeva, Nellie (March 11, 2016). "Jordin Sparks Joins Time After Time ABC Pilot From Kevin Williamson". Deadline.com. Retrieved August 26, 2016. ^ "Dear Secret Santa". myLifetime.com. Retrieved 2014-08-09.